Completion of at least 4 full courses OR one year of full-time degree studies at an accredited university. Minimum overall average of 2.0 on a 4-point scale (C/60% or equivalent). If you're applying to Honours-level programs: Minimum overall average of 2.3 on a 4-point scale (C+/65% or equivalent). All attempted university courses will be included in the calculation of your cumulative grade point average. Courses that are repeated will only count once towards the accumulation of transfer credit. Find more information about admission requirements. 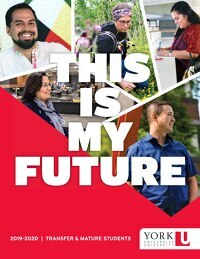 York University welcomes applicants who are looking to finish their degree or upgrade from a Bachelors degree to an Honours degree or wish to complete a second degree program. Transfer Credit from a Canadian University is usually granted on a case-by-case basis.